Gary Numan – Iconic British new wave singer/songwriter/recording artist and record producer, has had a career spanning 5 decades, and he’s still going strong. Numan recently released “Savage: Songs from a Broken World” – a new album contemplating a world devastated by climate change. Catch him in concert during his “Savage European/US Autumn Tour”. If you reside in Los Angeles, you can see Gary Numan perform at the Fonda Theatre on October 6th. Visit his website for more info, or buy tickets here. SoCal Magazine’s Niki Smart caught up with Gary Numan for a quick interview. Dennis Morris told me that you were once detained in Russia for accidentally flying over military airspace (or something along those lines) – can you tell us a little more about that experience? Your career has impressive longevity with numerous hit songs. Do you have a favorite—and why? GN: Favorites change depending on mood to be honest but a song on the new Savage album called My Name Is Ruin is a big favorite because my daughter Persia sings on it with me. She joins us on stage when school allows and sings with us all over the world as well. I love that. What’s the best thing about being Gary Numan? GN: I get to do live my life the way I choose to for the most part, not the way I have to. If I wake up and it’s a beautiful day, I don’t have to work, it’s up to me. That freedom is very special to me. 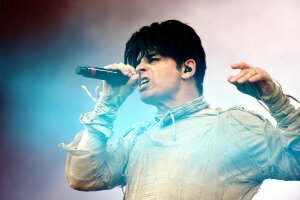 What’s the worst thing about being Gary Numan? GN: My touring work takes me away from my children for months at a time. That’s a real problem for me. Apart from that though there is no ‘worst’ thing. I love my life. I love living in Los Angeles, being in a band, I’ve been happily married to Gemma for 21 years and my children are all healthy. I have no complaints. What do you have coming up that you’d like our readers to know about? And I know this is a bit of a curve ball but…do you have any thoughts on climate change? GN: The Savage album is all about a world devastated by climate change, so yes, I have lots of thoughts about it. I believe it’s very real, very dangerous and I could hardly believe it when Trump pulled the US out of the Paris Accord. It was a level of ignorance that was hard to fathom.